They say where there's smoke, there's Bluetooth. Wait, that's not it. Yeah, actually, now it is. Now that Masterbuilt, a leader in making stuff to cook things outside (and some inside), has enhanced its digital electric smoker with the capacity to be controlled by an app downloaded onto a smartphone. With it I can now do, well, pretty much nothing after loading four slabs of St. Louis ribs. I close the smoker's door and step inside the house. I take my phone out of my pocket. I turn on the smoker. I set the temperature to 225°F. I set the time for four hours. I sit and watch the game. Other than refilling the very user-friendly wood-chip cylinder with more hickory, I am cooking by remote, checking the temperature by looking at my phone. I know what you're thinking: electric smoker? What the heck? But this is not another chapter in the argument over what is "real" barbecue. That's an argument that doesn't really matter if, instead of looking for a smoke ring, after your giant short rib is ready, you begin by asking, "How does it taste?" If the answer is "Dadgum that's good!" (also the name of the original Masterbuilt cookbook) then you will be way ahead of the game and can concern yourself with keeping your cigar lit. In my tests, the new Bluetooth "Smart" smoker has taken about 25 minutes to get to temp and then held steady. Three hours in, I take two rib slabs, put on my honey glaze and wrap them in foil. The other two slabs I spray with apple juice. With the wood-chip chamber on the side you don't have to open anything and lose heat. The new drip tray is larger, has moved to the front and slides out easily. The meat probe works a bit better than in previous versions (though I'm not using it on the ribs), but I've never found that just one probe is enough. So, I typically open the door for extra readings before the product is done. Even so the temperature holds so steady that the meat's internal temperature can be managed with ease. The ability to cold smoke at lower temperatures is a great bonus. 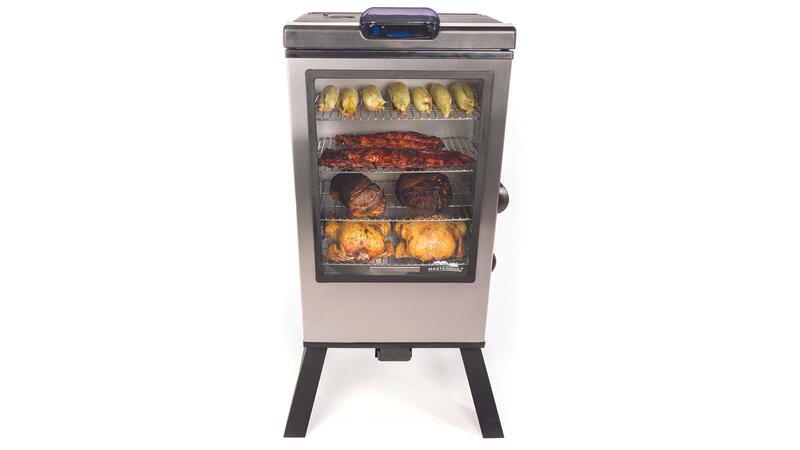 The Bluetooth smoker resembles your old college dorm fridge and comes in 40-inch ($429) and 30-inch ($329) versions. Get the larger one. You'll appreciate the extra room and power down the road. You'll also appreciate smoky, golden-brown, tender-but-not-too-tender ribs like the ones my guests and I are about to inhale.